Ha! I lied. Still in trout mode. No salt just yet! On the Lehigh, there are bugs and there are fish rising. Of course this time of year, the window of opportunity is not entirely too large, but if you pick your spots you can cash in on some decent late-season dry fly action. Fish are being caught all the way down below Treichlers. Amazingly enough these fish look like they ate their way through the summer with no tell-tale signs of stress present. Just think how this fishery would be if we had coldwater all summer long!!! I tell you what. 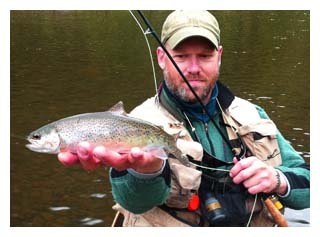 With the current weather pattern, and the steadily dropping flow, the Lehigh should fish well for the forseeable future. The key is to look for those days with minimal wind and bright sun. This time of year the heat of the day is where it is at, and the hotter the better, even if there is bright sun. October 10, 2012 - Important Stakeholder Meeting - ATTEND IF YOU CAN!!! 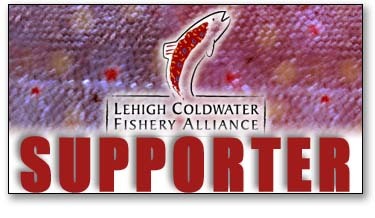 This Thursday - October 11 - is a very important meeting for all Lehigh River anglers. It is to be held at Nescopeck State Park at 7pm. We really hope Lehigh River anglers take the time and show their support for the River at this and futuremeetings this Fall in order to make a point that WE want to see a fair release schedule that benefits all user groups. This past weekend was the last hoorah for the Upper D, since it was time to shut down the camper. So where did the season go?! This year unlike the past few has featured fantastic fishing right up through September. Last year, if you recall, we got the big flood from Hurricane Irene and Lee. That pretty much wiped out the late season hatches. Bugs that are hatching continue to be Isos, olives and hebes. There are also quite a few caddis in the air, but I am not so sure they are hitting the water. The bankside brush and trees are loaded with them. The good news for the dry fly aficionado is that the fish for the most part are not picky at all. There is also an enormous number of smaller fish. This is great too see. Lots of cookie cutter rainbows and browns. I am sure that if you get some off color water, the streamer bite is very good. So that is it for the Delaware, and as we move into October, we move to the salt!